Mira is doing so much better! We've visited her for the last three days. On Wednesday, we kept her in the kennel since it was our first time visiting. We knew that she'd get excited seeing me and the five kids. We didn't want her to get re-injured. Yesterday the vet tech offered to let us take her outside on the leash. Wow! That was a big deal for me! 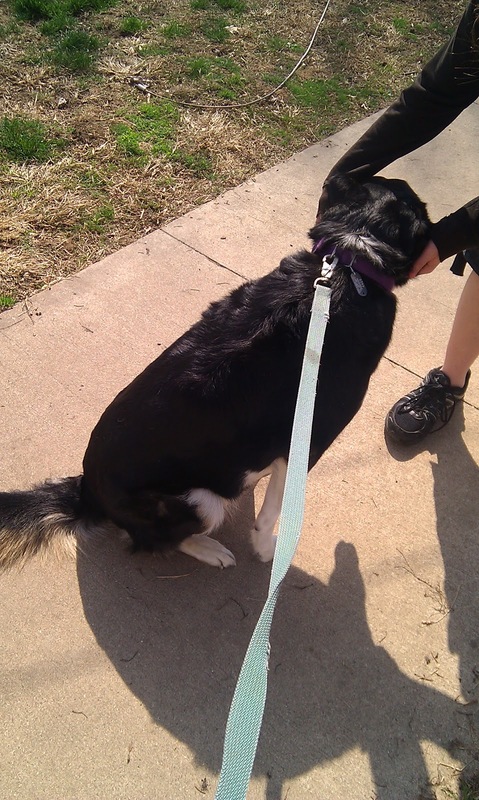 We put her leash on her and took her out to the fenced in area. She was so excited to be spending time with us, talking up a storm. She lead me to the groomer's building to say hello. Then she lead me to the back gate almost as if to say, "Let's go home!" She was putting weight on both legs, taking little babysteps as she went. Considering on Monday (when hubby took her in) she could barely stand let alone walk, the improvement brought tears to my eyes. Her sitting posture was still off though. More of a slump to the side that a sit (see picture to the right). She had been doing this since she injured the first leg a few months ago. Speaking of the first leg, it all started coming back to me. The chain of events. I was trying to remember what might have caused that first leg to be injured. It was all kind of a blur, but then it dawned on me. She started favoring the back right leg during one of our few snow falls of this winter. I remembered that we figured she probably slipped on some snow or ice and strained it somehow. Then the events of Monday night came back. 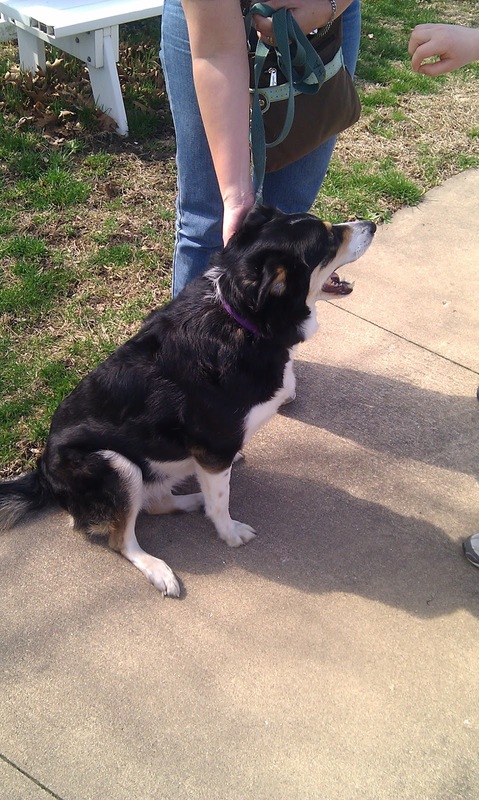 Mira was chasing after a soccer ball and made a hard turn, causing her to go down and lose use of her back left leg. Putting all of these things together (the events and symptoms as well as response to treatment), we figure she probably has a herniated disc in her lower back. This morning we went for another visit. Yes, she was walking a little better than the day before. Yes, she lead me to the groomer's building and back gate. This time she also lead me to the side gate that leads to the parking lot. However, what impressed me most was how she was sitting. Instead of being more slumped to the side with one leg kind of sticking out and the other one almost sideways under her, she had a normal pose. She sat straight down! (see picture on left) Her legs are under her as they should be! This is something she hasn't done in months! I was such a proud mama, going on and on about how nicely she sat! I bragged to the vet! I bragged to the vet tech and office manager! The kids were also beaming! She still has healing to do and will be on strict cage rest until cleared by the vet. She will only come out of the crate to go outside for the bathroom. If she behaves, we may let her lay on the floor in the living room while we watch tv or out on the back deck while we look at the stars, on a leash and only with vet approval. I've been told that eventually she'll be able to play soccer with the kids again, but not for a while. Considering my worst fears Monday night, I'll take it! Thank you for all of your prayers! YAY for positive pet prayers! Glad all went OK with Mira and she's on the mend!